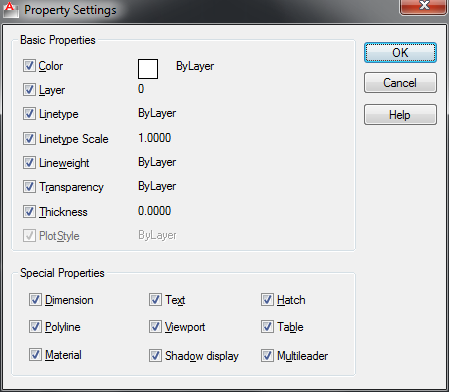 Many of AutoCAD users already know that we can match object properties using MATCHPROP (or MA for short key in). This tool is convenient for you who wants to change object properties to copy other objects. But many of us don’t realize that there are some settings that we can use this tool. It allows us to use this tool to match only a specific property. So you don’t have to use a separate tool like LAYERMCH to match just the layer. Let’s say you want to copy an object line style. But you don’t want to copy its color, layer, and any other properties. Let’s try to activate this tool. Type MA then hit [enter]. You can also use run this command from AutoCAD ribbon> home tab> clipboard panel. After you activate the tool, pay attention that there is an option to choose settings in AutoCAD command line. Type S then hit [enter]. You will see property settings dialog box. Uncheck anything that you don’t want to change. Click OK. Now you can copy selective properties to your AutoCAD objects! when I type MA then hit enter,there is no alternative such settings. You need to select an object before the settings appear. WOW… You rock… Bookmarked sir!